This 10-piece Nativity scene is handcrafted hojalatas, or handworked tin. Each piece is hand-painted with protective shellac. Tin-work is a specialty craft of Oaxaca, in Southern Mexico. The 10 figures all fit conveniently in a small box. 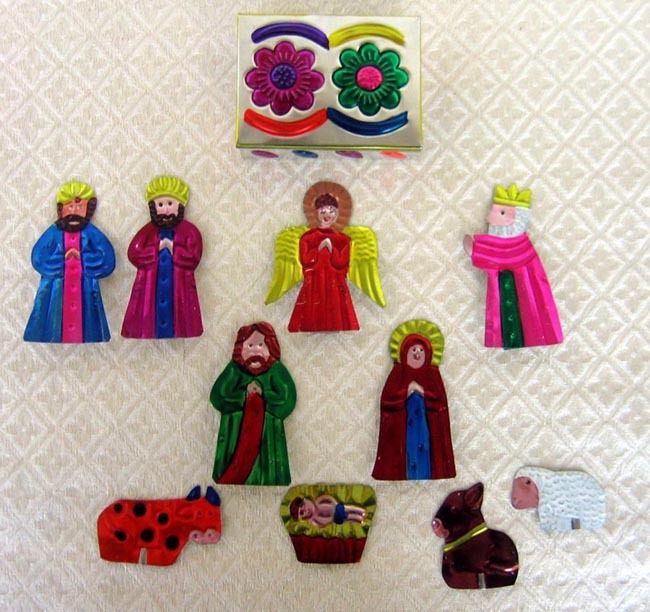 The pieces include Mary, Joseph, baby Jesus, an angel, three kings, a donkey and sheep, and a great red cow! All pieces have a piece of tin on the back to prop them up standing. The box is 3.5 inches by 2.75 inches by 1.25 inches. The figures stand 3.25 inches tall.